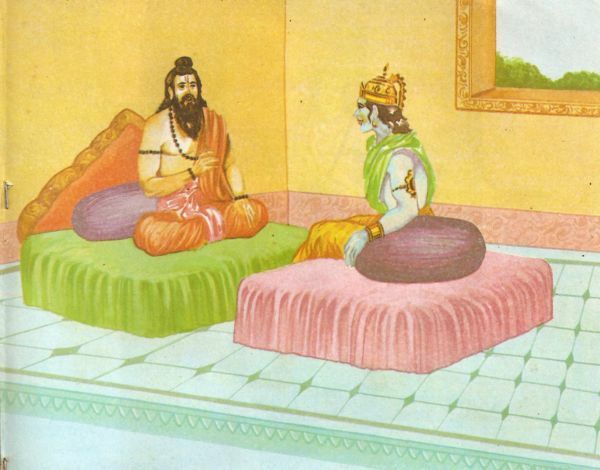 When Saint Valmiki was talking about Lav and Kush, Sita chanced to come there. 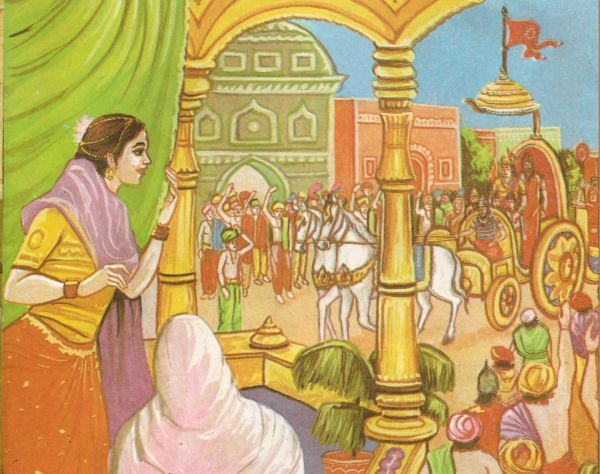 Seeing her, Bharata, Lakshmana and Shatrughna bowed low before her. Their joy knew no bounds indeed. 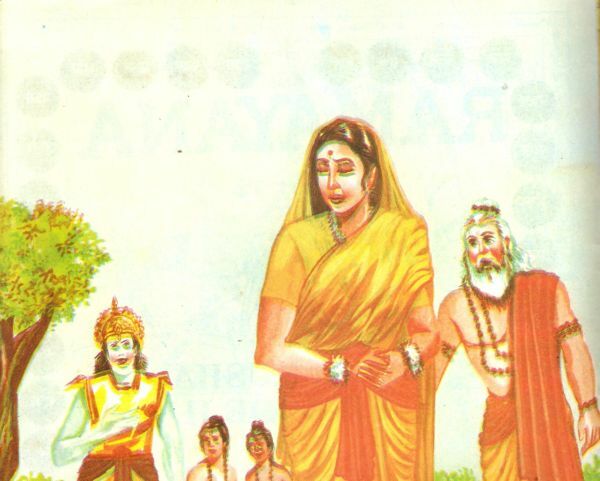 Rama too was overjoyed to see her but he remained apparently serene for fear of ill-talk. 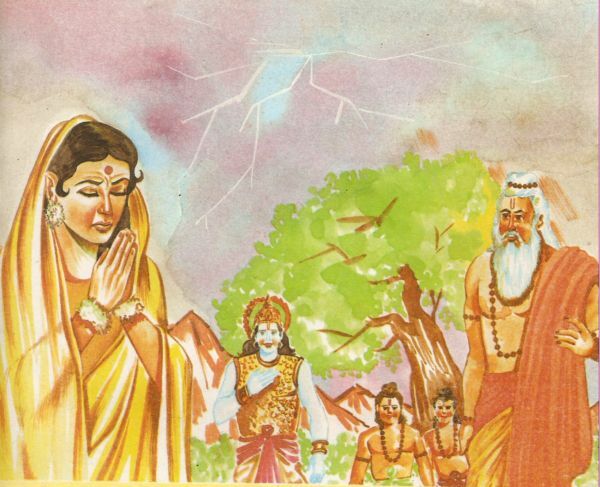 Hearing the saint’s words, Sita was tempted to go to Ayodhya but Rama’s silence over this point jerked her and she was compelled to change her mind. 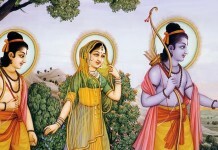 In response to the saint’s suggestion, Rama said, “Your words have left no doubt in my mind about Sita’s immaculate chastity. Nay, I had already been convinced of it as a result of the ordeal that she underwent earlier. But later on, an ill-rumor ran apace and I was compelled to leave her in the forest through my brother Lakshmana. I would request you, O revered Saint, to pardon me for this wrong. 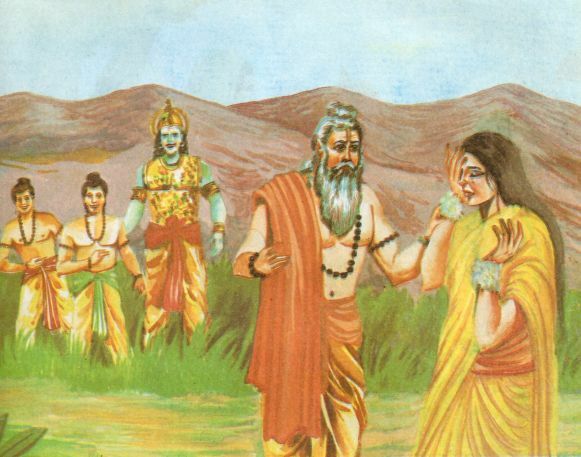 So, Lakshmana approached Sita and spoke with folded hands, “Be kind enough to forget everything and accompany us to Ayodhya.” But Sita did not agree to do so. 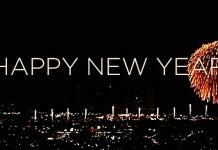 Hearing the profession, the directions began to tremble. Lightening flashed and clouds thundered violently. It looked as if deluge was going to occur. All of a sudden, there developed a crack in the earth and a divine light came to be emitted out of it. In no time, the goddess of the Earth came out of the crack. The divine light was coming out of the halo of the goddess who took Sita in her lap and gradually slipped into the crack. Seeing all this, the people of Ayodhya, present there, began to bewail bitterly. 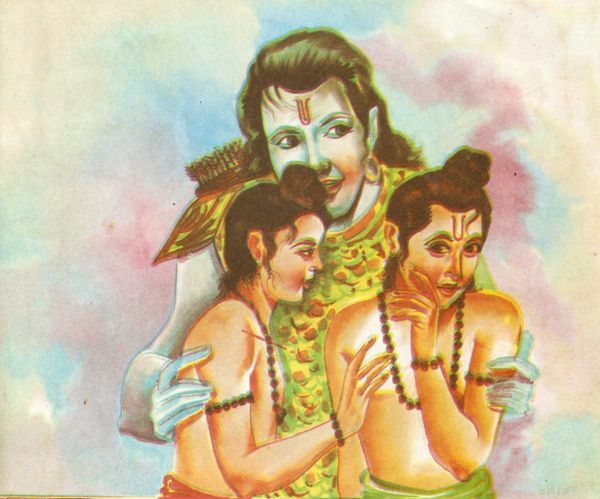 All the three brothers – Bharata, Lakshmana and Shatrughna were in tears. All present there spoke in one voice, “Splendid, O Sita! This earth is yet to produce an ideal lady like you.” As for Rama, he was dumb-founded to see his dear wife going into the lap of the earth. He kept gazing at her for a long time. Suddenly a divine voice was heard to say, “Shed all sorrow, O Rama! Sita is always with you. Through the power earned through meditation, she has reached heaven – your eternal place. You will see her there only now”. Hearing the divine words, Rama got some peace of mind. 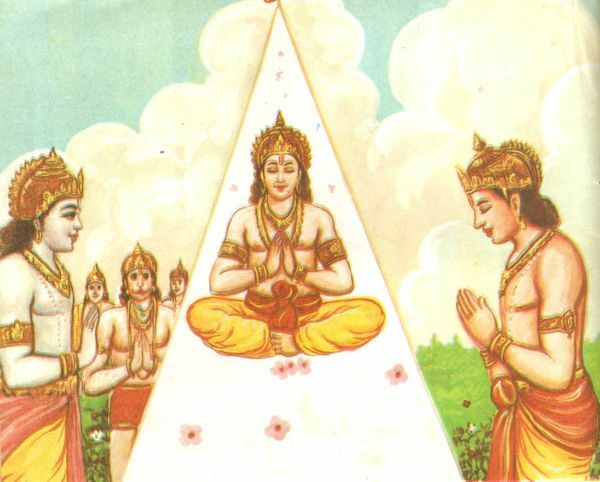 Then he sent for Lakshmana and said, “I am proceeding to Ayodhya along with my two sons – Lav and Kush – so that I may complete the yajna properly. 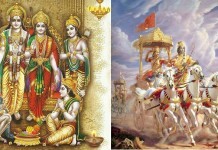 You should come along with all the people.” Saying so, Rama set out for Ayodhya accompanied by his two sons. Next day, Lakshmana too set out for the capital along with his two brothers, all the Vanara dignitaries and all the soldiers. Everyone was mourning Sita’s disappearance from the scene. Rama, having reached Ayodhya with his sons, completed the yajna in the proper manner as suggested by the rulers, kings, saints and hermits present there. Then he saw off all the royal invitees with valuable gifts. All the Brahmanas and saints were given liberal donations. They, in turn, showered blessing on him and his sons. 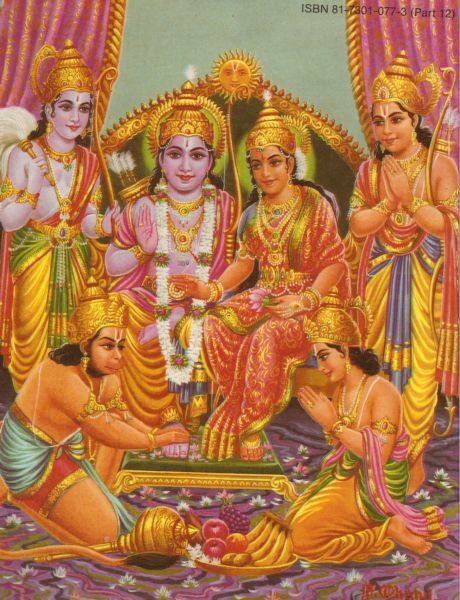 Then Rama came to his palace with his sons, though all the time he was thinking of his beloved wife Sita. The people of Ayodhya rejoiced the advent of the two princes profusely. The merriment went of for a number of days. The completion of the yajna made Rama a powerful emperor. He ruled as an ideal emperor according to the tenets prescribed in the religious books. God too felt pleased at the manner in which the things went on. Rains occurred well in time and crops flourished well. No epidemic or famine was ever heard of. 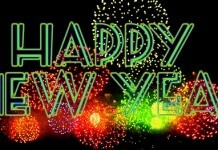 Untimely dearth’s were just absent and people lived in peace and prosperity. One day Rama happened to look into a mirror. The very sight of his face rendered him averse to worldly life. He thought of leaving the worlds and returning to her permanent abode in Heaven. So, Rama gave the rulership of different parts of his empire to Lav, Kush and the sons of his brothers. In no time, Narada can back accompanied by the god of Death. Paying his respects to the Lord, the god took his seat. The Lord, then, said to the god, “Rama’s life on Earth has finished. So, bring him back to heaven at once. Hearing this, the god of Death set out to bring Rama. The very next moment, the god of Death was reminded of the natural law that one who takes birth must die one day. So, he made for Ayodhya single handed. Reaching near the town he transformed himself as a Brahman and entered the town. 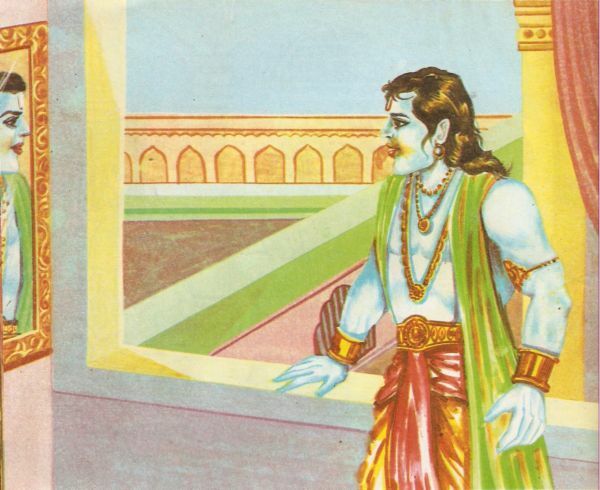 Reaching the royal palace, he saw that Lakshmana was standing at the gate of Rama’s palace. 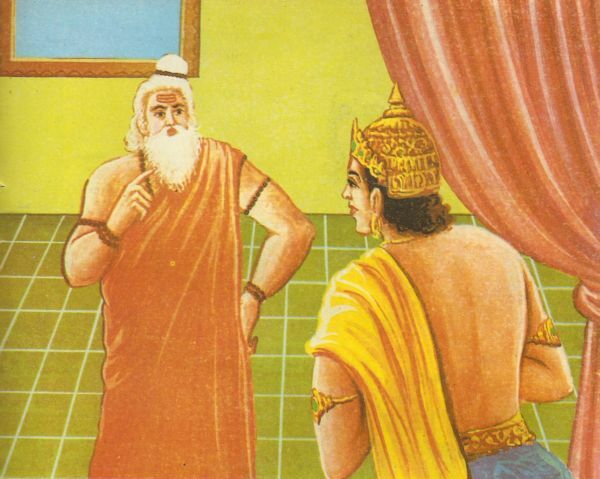 He asked Lakshmana to go and inform Rama of his arrival. Knowing that Death-god has come, Rama ran to the gate of his palace to welcome him. Then he showed him in most respectfully. “Don’t worry, sir. I shall ask Lakshmana to guard the door himself. He wont allow anyone to come in.” Saying so, Rama left the room. 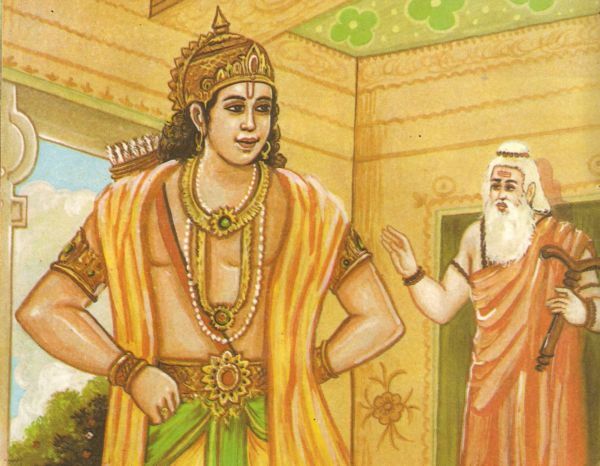 Smiling in his sleeves at he words of Death-god, Rama went to Lakshmana and said, “Brother! I am going to talk over some very important matter with the Brahman who has just arrived. You must guard the door in person. Never let anyone come in without my permission. If you violate this instruction, you will be guilty of disobeying me and will earn an instant death as a reward for this guilt. 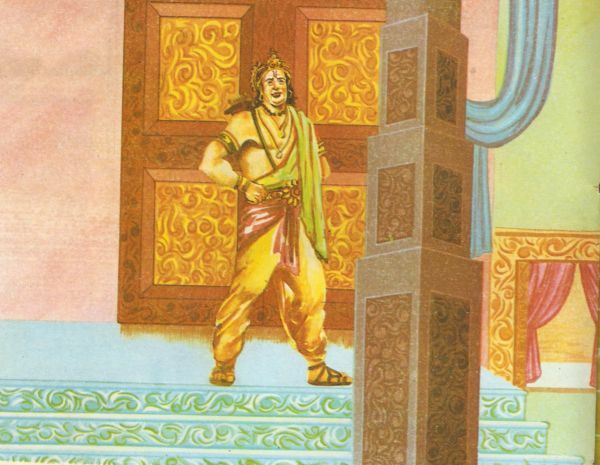 Rama closed the door of the room from inside leaving Lakshmana to stand guard outside. “Excuse me, O revered saint; my brother is having talks over a very serious and important matter at this time. He has ordered me not to let anybody go inside. So, I cannot go inside the room to inform him. You had better wait for some time,” Lakshmana replied very humbly. “It seems your days are numbered. That is why you have taken courage to violate my order. 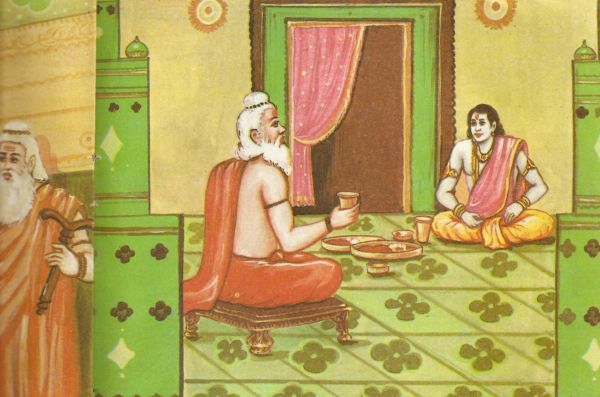 I curse you that you will die here and now to reach heaven.” Saying so, saint Durvasa advanced further towards the room where Rama was holding talks. “You haven’t done good, O Saint. You have done a big sin. Nobody can prevent what is to happen. So, you please leave this place at once. You had better not to disclose what is going on here,” said Rama. 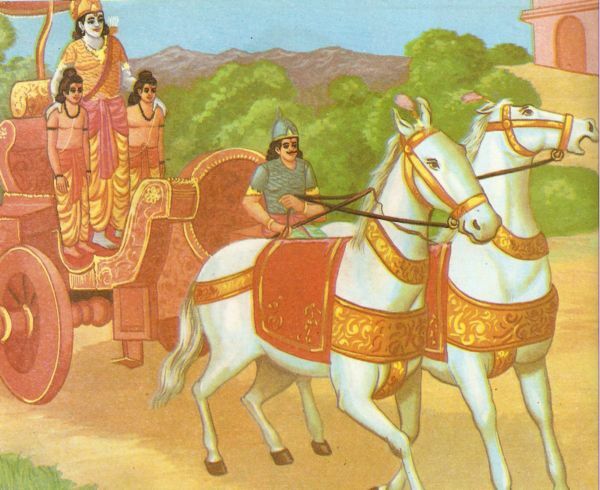 Hearing the words of Rama, Durvasa could not take courage to stay there any more. 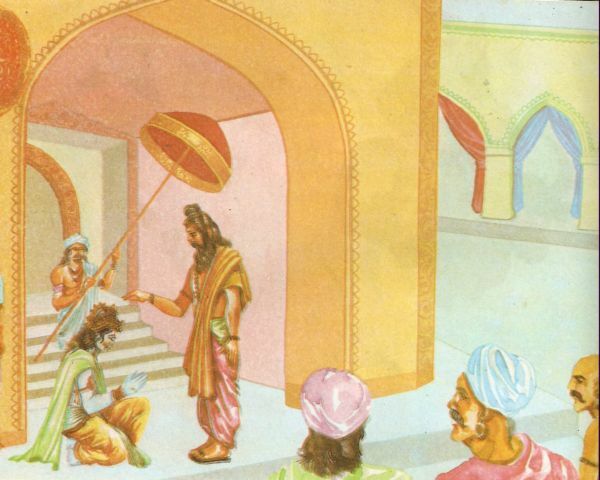 Rama expelled Lakshmana also for violating his order. Lakshmana, who had laughed away the saint’s curse, could not tolerate this punishment. Tears streamed down from his eyes. He left Ayodhya without even visiting his palace. Reaching the bank of the Saryu Lakshmana offered oblations and assumed a watery grave. God Indra came down and took him away in a skyey vehicle. 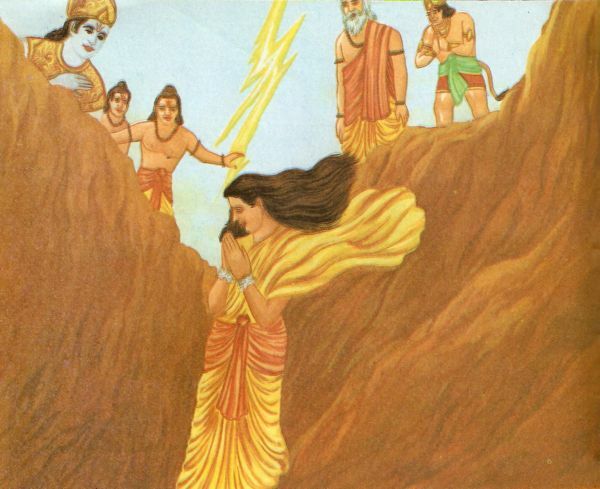 Lakshmana’s death plunged his three brothers in sorrow. 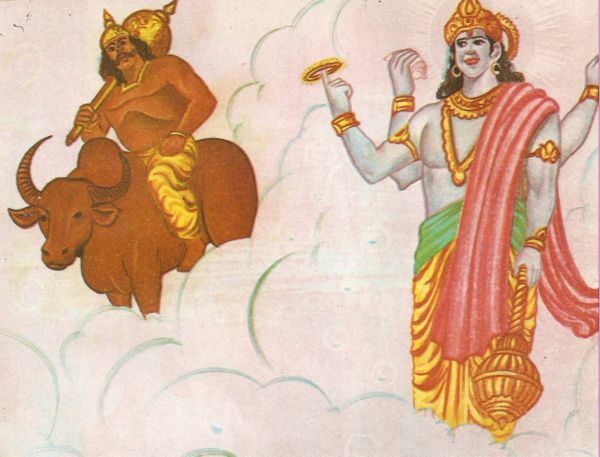 They kept looking at the vehicle that took away Lakshmana to the heaven. 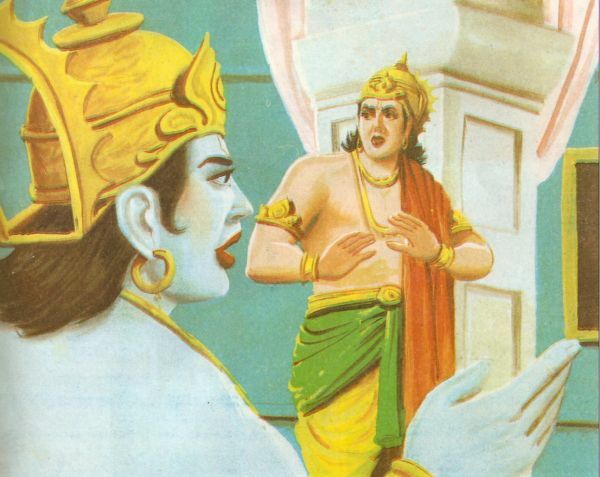 Bharata felt very upset to hear Rama’s words. With folded hands, he requested him, “Brother! I have no craving for the throne. I am not ready to accept even heaven in your absence. I must go with you. Be kind enough to allow me to do that. 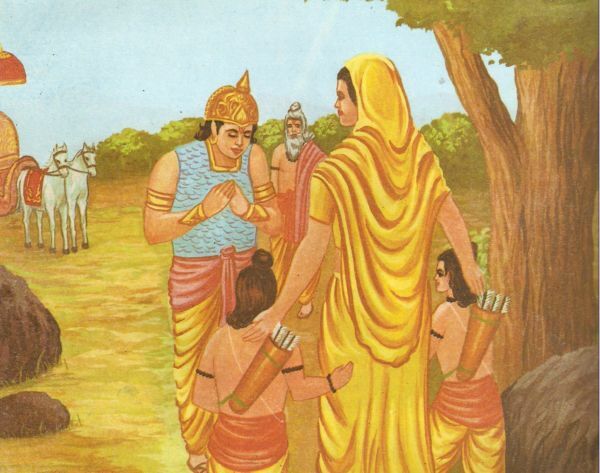 Seeing his brother adamant, Rama permitted him also to accompany him. Then he sent for Hanuman and said, “Dear! You have made up your mind to lie very long. So, you must live happily here keeping me in your mind. 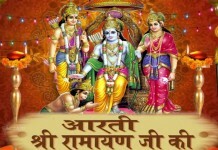 That is my suggestion.” Saying so, Rama made for the Saryu along with his two brothers. People of Ayodhya too came to the Saryu River along with their ruler – Rama. The river was in spate at that time. Rama stood at the bank and invoked Lord Shiva. Then he began to advance into the river water followed by both his brothers – Bharata and Shatrughna. Just then a divine voice said. 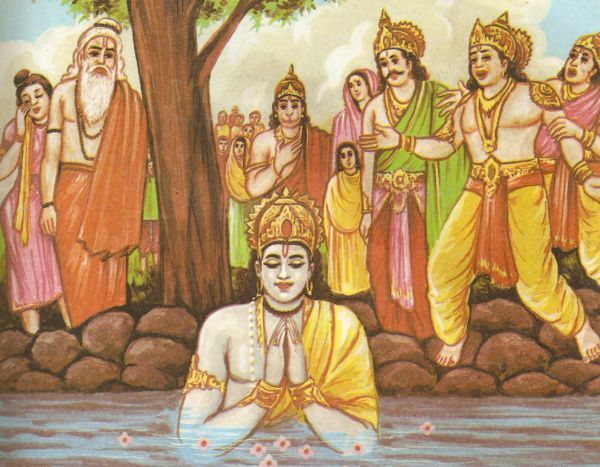 Hearing the divine call, Rama smiled and assumed a watery grave along with his two brothers. The people of Ayodhya began to bewail bitterly. 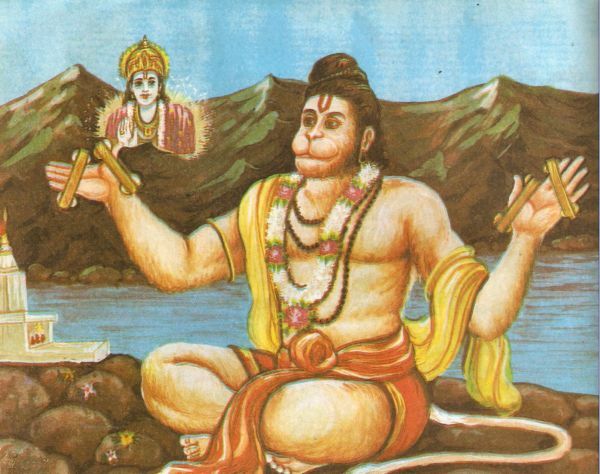 As for Hanuman, he became immortal as a result of Rama’s blessing and the boon. He visits a new Rama temple on the earth every day and remembers his Lord- Rama. The great poet Tulsi Das saw Hanuman in a temple in the form of a leper. 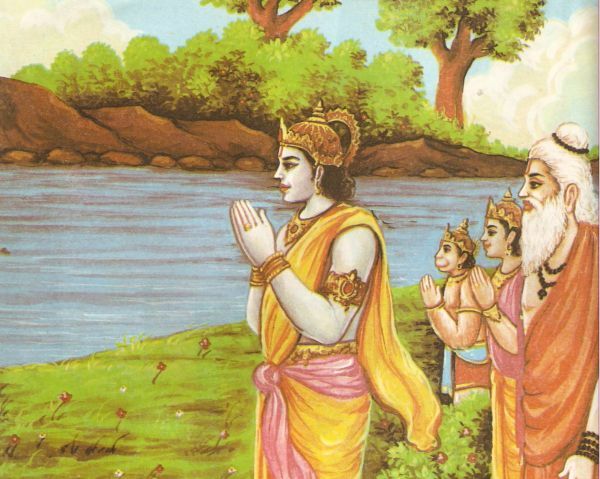 The Ramayana – story of Rama – is no less than a Veda. Its study and meditation gives one a long life full of luck and prosperity. 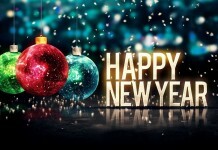 It does away with the past misdeeds and all desires are fulfilled. The issueless get children and have-nots roll in wealth. The condition is only a concentrated meditation of his great holy book. One who recites the holy saga of Lord Rama with unflinching devotion, gets rid of all worldly worries. Its study, whether in the morning, at noon or in the evening – keeps one safe from all ills and sorrows.